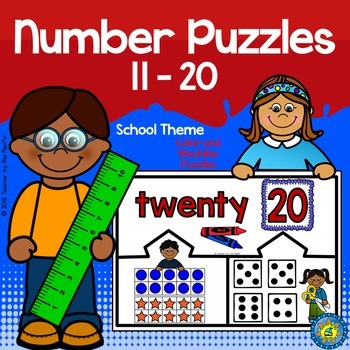 Included in this set are number puzzles 11 – 20, with a school children and school supplies theme – perfect for back-to-school or for math centers throughout the year. 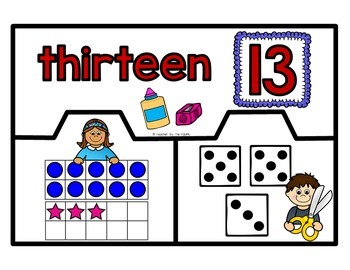 Children match the numeral/number word, dice, and ten frames. The puzzles help to strengthen counting and cardinality skills, in particular by reinforcing subitizing skills. They are especially useful at the beginning of first grade, to review the teen numbers, as well as in kindergarten to reinforce learning those tricky teens! Color puzzles as well as blackline masters are included, should you wish to have your children color, cut, and have their own puzzles to keep. OR, print the blacklines onto colored construction paper or tag board, laminate, and use at a math center. This option will save on colored ink. 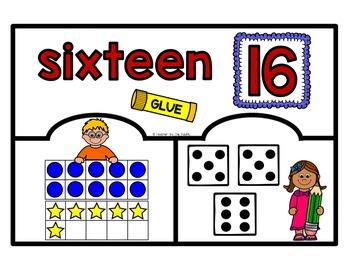 The puzzles may be used at a math center, during small group time, or as an independent activity. There is one puzzle per 8.5” x 11” page; when trimmed, the puzzles measure 7” x 10”. I like to have smaller puzzles; simple directions are included if you would like to print 2 puzzles on one sheet. These puzzles will measure 4" x 6". Simply print on cardstock or heavy paper, laminate for durability if desired, cut apart the puzzles, and store in a Ziploc bag or envelope. Count to answer "how many?" questions about as many as 20 things arranged in a line, a rectangular array, a circle, or as many as 10 things in a scattered configuration; given a number from 1–20, count out that many objects. 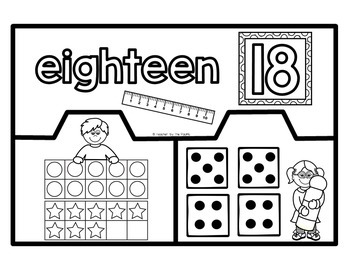 Work with numbers 11–19 to gain foundations for place value: Compose and decompose numbers from 11 to 19 into ten ones and some further ones, e.g., by using objects or drawings. Please e-mail me with any questions about this resource or suggestions for future resources at: teacherbythepacific@gmail.com. If you are dissatisfied in any way, please contact me right away by email or in my “Ask a Question” section, and I will do my best to resolve any issues! To receive email notifications from TPT about temporary discounts on my new product listings, just click the “FOLLOW” button at the top of THIS PAGE (by the green star).